THE UNITED STATES general election was the most talked about thing on Facebook in Ireland and the rest of the world in 2016. The election topped the list for Facebook mentions throughout the year, highlighting just how many people felt the result would impact their lives. Data released today shows off the most talked about things on Facebook both in Ireland and around the world so far this year. In Ireland, our own general election came second place in most talked about moments this year. The fact that the Irish general election was early in the year (February) compared to the US election in November means that the online interest wouldn’t have been sustained throughout the year. Brexit, David Bowie, the Easter Rising and GAA All-Ireland Final all made the top 10 in mentions for Ireland this year. In terms of events that generated the most global interest, Pokemon Go, the Black Lives Matter movement, Brexit and the Super Bowl all feature in the top 10 list. The lists are created by measuring how frequently a topic was mentioned in Facebook posts made between 1 January and 27 November, 2016. Mentions are analysed in an aggregated, anonymised way and then ranked in terms of popularity. Facebook also released its most popular Facebook Live videos of the year in Ireland and the rest of the world. In Ireland, a video of traditional Irish dancers the Byrne brothers dancing in Eyre Square in Galway was the most popular Facebook Live, garnering three million views and 75,000 likes. 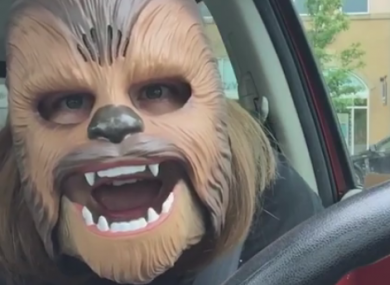 Globally, the most popular video was Chewbacca Mom from Candace Payne, which had 162 million views and 2.9 million shares. Email “From the All Ireland Final to Chewbacca Mom - here are the most talked about things on Facebook this year”. Feedback on “From the All Ireland Final to Chewbacca Mom - here are the most talked about things on Facebook this year”.